WWHHOOAAAA WE’RE HALFWAY THERE – ok no more singing for the remainder of this post. Pregnancy is flying but also seems like it lasts forever?? I can’t wait to have our baby in my arms but I also love being pregnant. No really, I…LOVE…being pregnant. To the point where I wonder if I annoy Jason by talking about how much I love it (don’t worry, he enjoys hearing it). 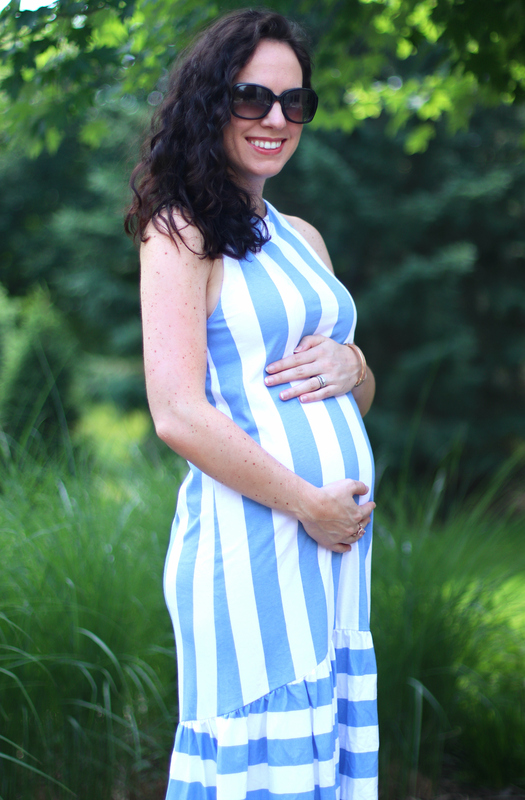 Loving pregnancy doesn’t mean I haven’t had many symptoms – hooo boy do I have symptoms. However, you don’t have to love pregnancy to be a great mom…I know several women who didn’t enjoy pregnancy and that’s ok! The end result of a healthy babe is all that matters, right? Right. Moving on. I have been keeping notes in my phone about each week so I can look back someday and remember/laugh at all the craziness. Read on if you’re so inclined. Edited for clarity and deleted the TMI portions for your own protection. I took an EPT at 3 weeks + 4 days and it was negative. So the one I took at the 4 week mark I was also expecting a negative. I woke up, took the test, got dressed for the gym and got in the car. I was sitting there thinking AH! I forgot to check the test! I briefly considered just forgetting it because I was sure it was negative, but just to be safe (and not to waste $8) I got out and ran back upstairs to check. “PREGNANT” …. what? Wait, what? WHAT? I had to FaceTime Jason because he was out of town for work (that was kinda sad) and we laughed and cried in disbelief. He came home the next day and it was so special to celebrate the news all over again. Why doesn’t my doctor want to see me like, yesterday? Doesn’t she know I have something growing inside of me? Helloooo?? *googles* nevermind false alarm, that’s normal. Welp now I have to wait 3 weeks, AKA seventeen hundred lifetimes, to go to our first ultrasound. I have cramps, I’m tired, and I’m withdrawing something serious from caffeine. I require a forklift to get myself off the couch. Carbs please. No, that’s not enough, gonna need much more carbs than that. Yep even more than that. Like, several more carbs. Liiiittle more… ah, perfect. Doctor saw me and I asked a million kajillion questions and we got to see our healthy baby with an ultrasound – what a feeling!! 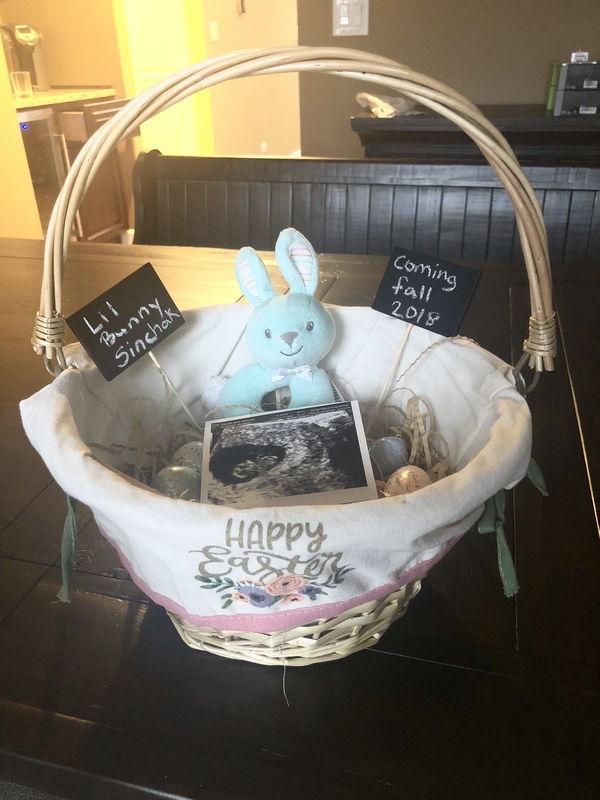 We told our parents about the pregnancy on Easter weekend! It was so much fun!! But also a little bittersweet since for what seemed like forever it was just Jason and my little secret. I have gained a bunch of weight and foolishly convinced myself I have a baby bump, paying no mind to my 3 week carb binge. I feel guilty but chalk up the carb cravings to the baby needing folate. Feeling great! Working out 6-7 days a week and enjoying every moment! I got a trainer and he is pushing me to my limits while keeping my workouts safe for baby! Back to my healthy non-pizza eating habits! Gaining weight much more gradually! Buying new clothes to fit the bump! Had the nursery painted! Doing a ton of home projects (will make a post on these later) so that they’re done before baby comes! Ahh this is so much fun! Ok, second half of cooking this baby, let’s see whatcha got. If you just read that entire thing, thank you!!! It’s wonderful to have friends and family and readers that care to follow along. Dress is from ASOS and only $40! The yellow one is only $17.50.